From our Highland Park Collection, these new tiles are the perfect accent for your new kitchen or bath remodel or new build. Whether your home is in our New York service area in Manhattan, Brooklyn, or near our tile showroom in Queens, you’ll be delighted to see what our design staff can do with this amazing new product! Architects, homeowners, designers and contractors will love the beauty and versatility of mosaic tiles. 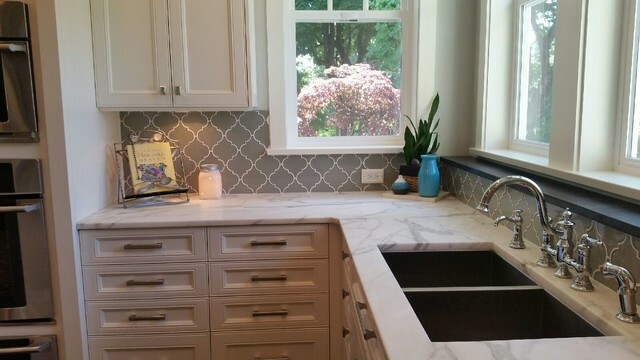 Imported from China, Arabesque tile is a great choice for backsplashes, countertops or tub surrounds. With interlocking pieces that are amazingly easy to install, these mosaics add interest and intrigue to modern, contemporary and traditional interiors. Their distinctly different curved lines are a welcome departure from traditional square or rectangular chips. If you’re looking for a hint of whimsy, crave a romantic interlude to casual or formal spaces, or simply need a touch of glitz and glamour; this new tile is a perfect complement for your Manhattan, Brooklyn, or Queens penthouse, apartment or brownstone. The design possibilities are endless! 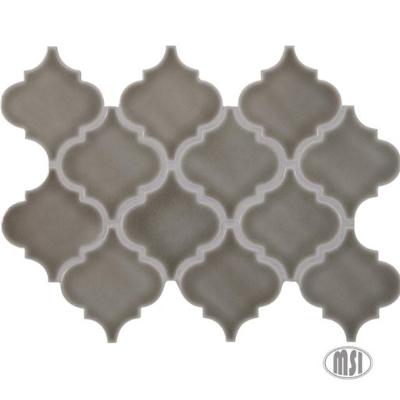 Dove Gray Arabesque Tile in our Shop. Choose Dove Gray Arabesque tile to complement cabinetry in nearly any style you choose from Shaker and Arts and Crafts to Colonial and Contemporary. 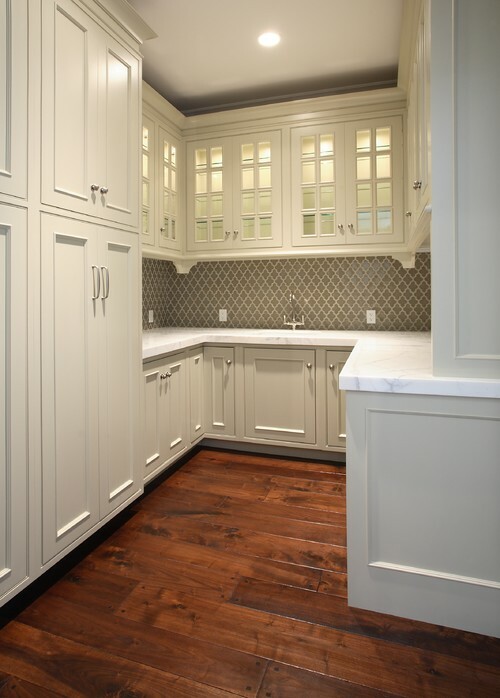 The more intricate lines of arabesque tile enhance the sleek and simple profile of modern cabinetry and interiors. Add a backsplash underneath cabinets and along every wall to create a cohesive, uniform look to your new remodel; or install an entire accent wall for added drama. Mosaics also work well on kitchen countertops. 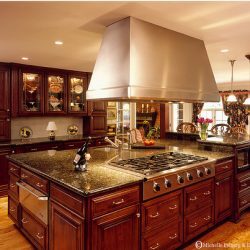 Get durability, shine and innovative design without the high cost of granite, quartz or other solid surfacing materials. 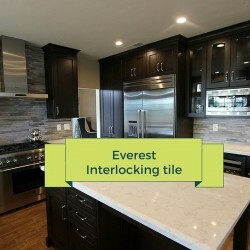 Your installer can create one-of-kind counter tops to fit almost any configuration at a fraction of the cost of granite! Get the feel of a custom spa right in your Manhattan, Queens or Brooklyn home with arabesque tilework on shower stalls, tub surrounds, walls, and countertops! Imagine a custom tiled tub surround and standalone shower with breathtakingly beautiful arabesque tile! Our designers can create a serene environment to relax after a hard day’s work or shopping and an ambiance so luxurious you will never want to leave. It’s timeless, suits any decor and is easy to install. If you’re wondering if Dove Gray Arabesque tile will fit in with your color scheme, worry no more! Gray is the new neutral that goes with nearly every color palette from brilliant jewel tones to subtle pastels. A soft gray reflects light and absorbs the color of surrounding walls for a soothing monochromatic palette—-perfect for intimate areas in the bathroom. While in the kitchen, adding a soft neutral gray tile makes your appliances and cabinetry pop. Don’t miss the opportunity to delight your clients in Manhattan, Brooklyn or Queens with innovative Dove Gray Arabesque tile incorporated into custom building plans, interior design, and remodeling projects. This product is sure to amaze even the most discriminating customer. Tiles come 12 chips to a sheet and are interlocking. One sheet measures one square foot. Visit our porcelain and ceramic tile showroom in Queens, New York; or take an online virtual tour of our complete HomeArtTile cabinetry, countertops, and tile.